The 2018 NFL Draft is only 3 weeks away and we are gearing up to predict who will become the next beacons of hope for the Miami Dolphins. It seems that every year we say how difficult it is to guess who Miami will be drafting but I must admit this year is tougher than usual. There are an unusual number of quarterbacks that will go in the top 10 and that will drive several elite prospects down to where Miami is picking at number 11. The flip side to that is Miami has not been shy about showing their interest in those top quarterback prospects due to the health concerns of Ryan Tannehill. You can't become a franchise quarterback if you can't get on the field. Rather than do a complete 1st Round Mock Draft I will look at guys Miami can target with each pick this year, but to do so we will have to examine who will go prior to Miami's first pick. We'll also take a look at Miami's major needs even though they will look at value with each pick. As previously mentioned, Miami will be selecting a quarterback this year but probably not in the 1st Round. Ryan Tannehill is cemented as the starter for 2018 and probably 2019 unless a drafted rookie pulls what Russell Wilson did in 2012. Brock Osweiler, David Fales and Brandon Doughty will fight for roster spots but not challenge Tannehill nor do they give the Dolphins a reason to skip drafting a quarterback. My guess is that unless Baker Mayfield somehow slips to the 11th pick that Miami will be targeting a guy with starting capabilities but who probably projects as a really good backup in his first couple of seasons. We saw that Jay Cutler and Matt Moore were not "break in case of emergency" guys who could hold up for more than a few games. The other position on offense Miami must target is tight end. It just came out today that the Dolphins were the only other team besides the Jets to put in a claim on recently waived Clive Walford. They are hungry for help. Currently only AJ Derby and Marquise Gray project to make the roster and neither has flashed enough to comfortably be named starter. It is rumored that Patriots' tight end Rob Gronkowski is hitting the trade block but the cost may be too high for Miami and I strongly doubt New England deals him to a divsion rival. Regardless of his injury history and flirtation with the WWE, Gronk is still a force who has a few great years left in him. Kenyan Drake will get his shot to be a star running back and Frank Gore will help mentor him. Miami will definitely target a back in the draft or as a priority undrafted free agent. Adam Gase likes guys who can be a utility knife so I wouldn't be surprised if Miami opts for a late pick who can both block and catch. Remember, there will be a lot read option, misdirection and play action with Tannehill under center. Matt Burke and Adam Gase have mention linebacker and safety as priority positions. This draft is loaded with talent for each spot and Miami has been scouting guys heavily. Burke has been quoted as saying Miami needs hybrid guys in the slot to take on today's tight ends (HINT HINT ROUND 1!). There is a name I am very excited about who analysts are saying is getting a lot of hype but will slip on draft day due to the quarterback pursuit. Gase recently said he was disappointed that Reshad Jones and TJ McDonald did not mesh as fast as he hoped. I have also seen it written that McDonald's extension will stop Miami from pursuing a safety early. If the season started today Miami would have Raekwon McMillan, Kiko Alonso and Stephone Anthony as their starting linebackers. So that is a guy who hasn't seen a snap due to injury, a guy who got torched playing out of position and another team's discard who probably fits best as a backup. Me thinks Miaim will be targeting a linebacker early, or, will get a guy who can cover and rotate him into a 4 man unit. With teams playing a lot of nickel scheme these days it wouldn't be unheard of for Miami target linebacker in the middle rounds to fill out a spot rather than target an every down difference maker. The release of Ndomakung Suh leaves a huge whole on the defensive line. Miami appears to be set at defensive end with the addition of Robert Quinn to pair up with Cameron Wake, Andre Branch and Charles Harris. Hybrid linemen William Hayes will set the edge on early downs and kick inside for passing downs. That puts a lot of pressure on Jordan Phillips to be the lead dog, and second year defensive tackles Davon Godchaux and Vincent Taylor to eat up offensive linemen to cause disruption. There are a lot of rumors flying around about Miami targeting a defensive tackle in either Round 1 or 2, but my guess is they save that for Day 3. Okay, enough rambling. You know what the team needs and you've probably heard of several of these prospects. Again, this isn't what I would do but rather what I think Miami will do on draft day. The key things to remember here are scheme fits and locker room culture. Gase, Burke and Dowell Loggains have all prioritized getting smart players who understand the nuances of their positions and the scheme being implemented. You may be surprised by some of these names. Okay, couple of quick things here to digest. Buffalo is trying to trade like crazy to get a quarterback and Cleveland is also open for business. The Giants get Buffalo's 1st Round picks and then some. They then flip some of that haul to go back up and grab Chubb who fits the new 3-4 defense. It is possible however unlikely the Odell Beckham Jr. could be in that deal. 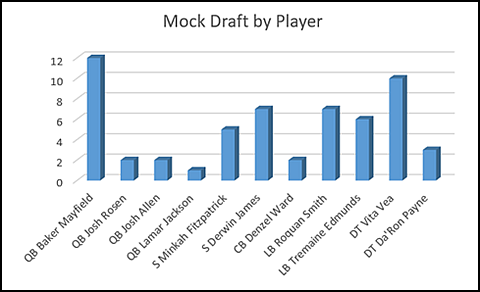 Word on the street is that Minkah Fitzpatrick holds more value with draftnicks than with the actual scouting community. Like we've seen in previous years, there is always a sure bet guy who suddenly falls out of the top 10. Miami is rumored to LOVE him and he is exactly what Gase and Burke are talking about in that hybrid situation. He has the flexibility to play cornerback as well but his responsibility would be the slot and taking out bigger tight ends. I almost had Miami moving up to get him until I read Louis Riddick's evaluation of Derwin James. This isn't the first time I've seen an analyst list him as the do it all safety everyone is sleeping on. To me he makes more sense for Tampa at 7 rather than the popular pick of Fitzpatrick. Now I realize a lot of you may say "but Roquan Smith is still available???". Remember what was written earlier about teams playing the nickel more often than base packages to accomodate a pass heavy league. Smith would be an ideal linebacker for what Miami needs but I think the value Fitzpatrick brings is much higher at the 11th pick. There are a lot of speedy, coverage linebackers to be had later in the draft who can rotate in with McMillan, Alonso and Anthony. Fitzpatrick will be a vocal leader in the locker room. A month ago you would have a tough time convincing me he falls out of the top 6 so this would be a huge win for Miami. I mentioned the move to claim Clive Walford as evidence Miami is on the hunt. I believe the primary target is Dallas Goedert but he will be gone before Miami picks in Round 2. Hurst offer the complete package as he can both catch and block. His only downside is that he is already 25 years old due to playing professional baseball for a few years. Miami has met with him and word is they (along with many teams) came away impressed. AJ Derby is more of a receiving threat who line up in the slot and Marquise Gray is more of a fullback/tight end hybrid. Hurst gives the Dolphins and Tannehill a dangerous threat up the seam who can also open up holes for Kenyan Drake. If it were me I would go with Mike White, but remember when I mentioned leadership? Luke Falk has been one of the most productive quarterbacks in college football. He had a down year in 2017 but we found out that was due to a hidden injury in his non throwing hand. Falk has been compared favorably to Kirk Cousins for good decision making, rhythm style passer but only an average arm. He comes from an air raid offense so it will take time to adjust to an NFL offense. His preparation has been described as maniacal in the mold of Tom Brady. He was a walk on and carries some swagger. I think Gase will love him and see him as a guy who can start in win games eventually. The reason I think Miami goes for him over smaller school prospects like Mike White and Kyle Lauletta is exactly what their description includes - small schools. It also would not surprise if teams went after those guys before Miami picks because they each offer better passing upside than Falk, but he has won at a high level and is worthy of a Day 2 spot. Another under the radar linebacker who coaches love and fits the coverage needs for Miami. He exploded on his Pro Day, is raved about by Dabo Sweeney, and is a big game player. I don't think it would take long for him to get significant snaps on defense and should be an immediate contributor on Special Teams with his speed. This pick may be more wishful thinking on my part because analyst Tony Pauline pegs him as a Day 2 selection now, but cross your fingers he is still on the board. It wouldn't shock me if Miami packaged both 4th Rounders to jump into the late 3rd if they get nervous he will be taken earlier. Tannenbaum has a history of making aggressive moves to get guys that Gase wants in the draft. Cornerback? But Miami has a ton of youth already? This isn't about need. Tavarus McFadden ran with cement boots at both the Combine and his Pro Day. Word is his stock dropped tremendously. Miami jumped on the value pick of Cordrea Tankersley last year and I suspect if a great prospect falls they'll do the same here. 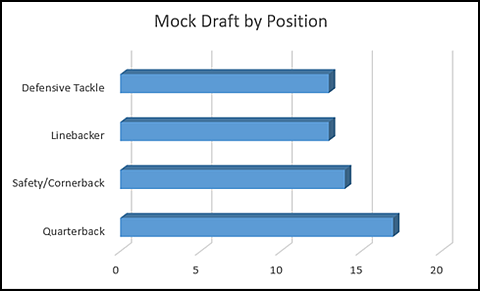 McFadden was a top 20 pick in many mock drafts only a few short months ago. Xavien Howard has injury concerns, Tony Lippett is coming off a torn Achilles and Bobby McCain works better in the slot. In his first season Gase said you can never have enough cornerbacks. Miami needs to fill the void left by Suh and while I don't think Jones is that guy he can certainly be a disruptive presence as a backup. They have shown interest in Jones and its possible he slides into the later rounds after being overshadowed by his teammates on a dominant NC State line. Ballage has everything Miami is looking for in a running back's skill set, but as analyst Matt Miller puts it - he is either fool's gold or a potential steal. Ballage should have been a Day 2 pick and is now more of a 5th or 6th Round prospect. We've seen bigger names fall out of the draft completely and I think Ballage is the type of risk Miami goes after. His ability to be a return man will take some pressure off of Kenyan Drake and allow him to be more of feature back. The Dolphins take a chance on a local product who has some position flexibility and probably should go higher than the 7th. Ja'Wuan James and Sam Young are currently on 1 year deals, and last year's rookie Eric Smith missed significant time after an impressive camp. Well there you have it. See you all on the boards! Just a quick 1st Round curveball. Miami has invited both Denzel Ward and Josh Jackson, cornerbacks, for official visits. Ward is definitely a top 10 guy and Jackson isn't far behind. If Miami is truly going BPA and either of these guys are on the board it wouldn't shock me to see them selected. They are better prospects than any cornerback Miami currently has on the roster, even if it truly isn't a need. You would have to see all 4 quarterbacks, Roquan Smith and Tremaine Edmunds, Minkah Fitzpatrick and Derwin James, Bradley Chubb and Saquon Barkley off the board for this to happen. I tend to agree that Miami is not going OL or DT with that early of a pick. I think their trade for Quinn shows what they think of the early edge rushers. I am very excited about this draft as we can walk away with a playmaker at pick #11. It's time to start to draft playmakers instead of role players. Several mocks have Baker Mayfield falling to the Dolphins at pick 11 which is very surprising, but there are good players at good defensive positions in this draft which are weaknesses on teams in the top 10. It is possible, but I would have to see it to believe it. This is such a tough one as the Dolphins are in prime position, due to all the "good" quarterbacks in this draft, to grab a playmaking defensive player if they stand pat at #11. If the Dolphins have a chance to draft QB Baker Mayfield or QB Josh Rosen, then they may try to trade up to #6 with the Colts if either one is available there. It will be very costly, so, my hope is that they stand pat at 11 and draft linebacker or safety. It is hard to say whom they value more as linebacker and safety are both positions of need due to some inept free agent moves. ReShad Jones and Tim McDonald are the same type of safeties, so, they have a need for a Minkah Fintzpatrick or a Derwin James at safety. Either would be the type of player who can jump in and cover a tight end which is what they really want in this draft. LBs Roquan Smith and Tremain Edmunds would be outstanding picks as well, but teams are using the nickel more than the traditional LB set. Let's not forget that our linebackers have real question marks coming into this season. To me, linebacker is a bigger need than safety, but it all depends on how Miami's draft board looks. Several mocks have QB Baker Mayfield falling to 11, so, you have that, too. It is doubtful that it happens, but the Dolphins would be crazy to not draft Mayfield if he is available at 11. If by chance that QB Mayfield, S Fitzpatrick, S James, LB Smith, and LB Edmunds are already gone, you can count on DT Vita Vea being the choice. Trading down should not be an option for the Dolphins as "The enemy of great is good". I just can't see Coach Gase allowing GM Chris Grier to let Michel get past them if he is available. He is the type of running back that Gase loves as he is shifty and fast, very disciplined, and is a very good pass protector. The Dolphins fell behind quickly in games last year and did not have the offense to keep pace. We then trade 1-6 to N.E. for their 1-23, 1-31 and 2-11 (The points are close.) We should get one of the three players we want, maybe two and still draft a TE with our second pick. If only one of those players is there, we could trade 1-31 to Indy or Cleveland for 2 of their 2nd round picks. While I'd love to grab Minkah Fitzpatrick, Derwin James or Roquan Smith (They're always gone by 1-11) with #11, this is a trade I could really get behind. I don't think Mayfield is getting out of the top 5. There was an interesting article I saw briefly that said teams are very unsure of next year's QB crop so they'll overpay for this year's group. There are some seriously elite prospects that should go over a few of these QBs so I can't see teams wanting to fall beyond the 15th pick. Its why I have a hard time believing NE can get high enough to grab one of them. I think they are preparing for life post Gronk and need some OL help as well. They can land a nice TE and OT in that 20-32 range. They all came out this year. There is a guy at WV though worth looking at. Kind of why I might trade them. But Mayfield has to fall, and like you, I don't see that happening. That's a good guess on top picks. Just wonder if Cleveland will move 4 to let Buffalo get ahead of Denver for a QB. There are some very good prospects to watch for next year. Will Grier from WV, Drew Lock from Mizzou, Clayton Thorson from N'Western and Jarrett Stidham from Auburn. As you know from past posts, I'm a big Thorson fan. Thanks, same goes for you. I'd love to get Fitzpatrick. I don't what Cleveland will do. It's hard to say no to Chubbs at #4. But then to get extra draft picks in this years draft and next years, and be able to take a pick with #12? I'd be torn. From what I've read, the Giants love Darnold. If Cleveland takes him at #1, there's a good chance they trade 1-2 to the Bills. I'm fine giving Tannehill his prove it year and then looking at next years draft for a qb if he doesn't do well this year. The smart move may be considering that in this draft if someone wants to trade up with us. Stock an extra pick for next year. I don't know anything about Thorson, but Grier and Stidham are intriguing. Get a good mid round guy this year, see what he brings to the QB room. If Tannehill falls flat on his face and you get the hunch that this year's draftee isn't "the guy" then the team should be in position to nab a 1st Round or high level QB prospect. Thorson has a good arm and makes NFL level throws. Would have easily been a 2nd Rounder this year and there were rumblings he'd creep into the 1st. High character/leader type. Plays with a meh supporting cast at N'Western. How are the prospects next year? I'm reading that teams are unsure of next year's quarterback crop and may make their QB move this year rather than wait for next year. There was much more hype on this year's crowd at this point last year. But a lot of scouts were disappointed that none really emerged as a certain 1st or 2nd overall pick. Also consider that at this point last year the talk surrounding Baker Mayfield was a Day 3 prospect who was the next Colt McCoy. Here's NFL Draft Scout's 7 round picks for us. They like your Hayden Hurst pick, Jammer. This would be a huge pick for us if he is sitting there for us. One thing that Dan Marino never had to worry about in his career was who his tight end was as The Don made sure he had a good one. BTW, the last time the Dolphins drafted a tight end in the 2nd round was in 1976.